Piksi Multi supports GPS L1/L2 and is hardware-ready for GLONASS G1/G2, BeiDou B1/B2, Galileo E1/E5b, Quasi-Zenith Satellite System (QZSS) L1/L2 and satellite-based augmentation systems. According to the company, the Piksi’s multiple signal bands enable 20-hertz position outputs with RTK convergence times measured in seconds and centimeter-accurate performance. Measuring 48 x 71 x 12 millimeters, the module includes an on-board microelectromechanical system (MEMS) inertial measurement unit (IMU) and magnetometer. Swift Navigation says the Piksi Multi Evaluation Kit has also been upgraded with all new components and contains two Piksi Multi GNSS modules, two evaluation boards, two GNSS survey-grade antennas, and two integrated radios providing data communications up to 10 kilometers-plus as well as other accessories required for rapid prototyping and integration. The evaluation kit is priced at $2,000. The company announced on Feb. 14, 2017 that it began shipping the Piksi Multi. It is accepting orders on its online store at <www.swiftnav.com>. Piksi Multi is an open platform that enables customers to run Linux OS on its second core, allowing them to prototype and adopt their own applications in a well-known and widely-used environment, according to Swift. The target application markets include autonomous vehicles, unmanned aerial vehicles, precision agriculture, robotics, space, survey and control, and R&D applications requiring precise positioning. 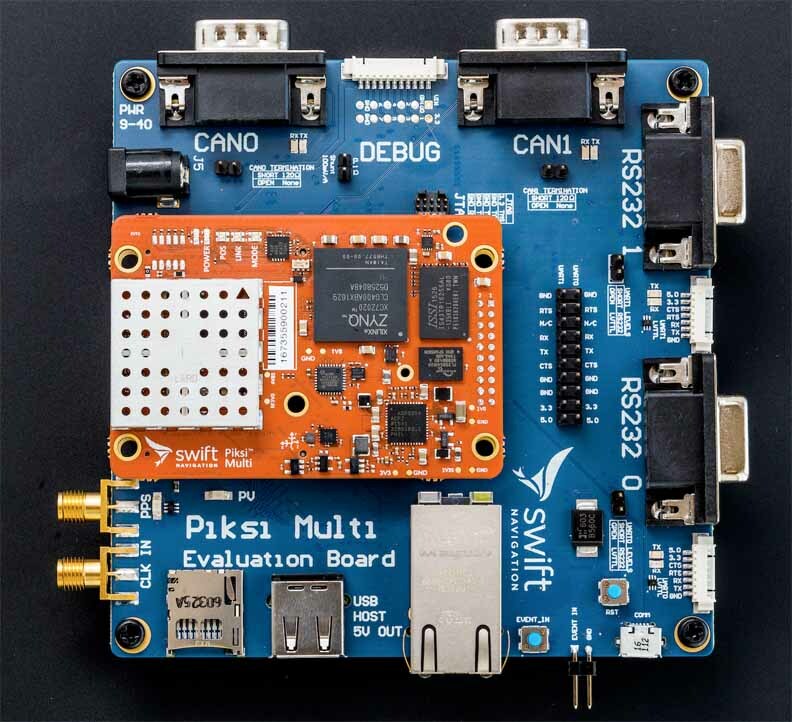 "With the launch of Piksi Multi, Swift is taking another huge step forward in delivering affordable and highly precise GNSS technology," said Swift Navigation CEO, Timothy Harris. Swift Navigation planned to show Piksi Multi at InterGeo October 11–13, 2016 in Hamburg, Germany at their booth located in Hall A1, in the U.S. Pavilion, booth #B1.061.